A few friends and I visited some Santa Cruz Mountains wineries during their January Passport Day. The main attraction for us was McHenry Vineyard, one of the region’s wineries that’s only open to the public during Passport events (the third Saturday of January, April, July and November). I traveled with Bryan, Wes, and Diane, and we made a couple of brief stops for provisions in Santa Cruz before continuing to the wineries. We picked up some charcuterie at El Salchichero and bread at Kelly’s French Bakery – both located in the same complex of buildings as the Surf City Vintners collective – and then drove up the coast for a few miles before turning inland toward the small town of Bonny Doon. Just a mile or so north of Bonny Doon, we headed up a small side road where we soon came upon McHenry Vineyard. Passing alongside the vineyard, surrounded by soaring trees, we parked next to a small wooden building that houses the winery and we walked inside. The winery was founded by Dean McHenry – the first chancellor of UC Santa Cruz – and his wife Jane, along with their son and daughter-in-law Henry and Linda. Linda had studied viticulture at UC Davis, and Henry, who was a noted anthropology professor there, learned winemaking from his Davis colleagues. Dean passed away in 1998 but Jane celebrated her 100th birthday last year. The vineyard and winery are still family-run, and Henry’s son Ian McHenry and son-in-law Brandon Blanchard were on hand in the winery to pour three recent Pinot Noir releases and two older bottlings. McHenry 2010 Pinot Noir, Estate, Santa Cruz Mountains. Medium-light garnet color, with very pretty floral notes along with strawberry and cherry fruit, tea leaf, and earth aromas. Medium-light bodied with lively acidity and fairly mild tannins, nice. McHenry 2010 Pinot Noir, “Swan Clone,” Estate, Santa Cruz Mountains. Slightly darker color, featuring deeper black cherry and raspberry fruit, more earth and dried herb notes, plus a touch of baking spice and a savory, meaty component. A bit bigger and more structured in the mouth, with great acidity and a long finish, very nice. McHenry 2009 Pinot Noir, Estate, Santa Cruz Mountains. Lighter garnet color, this had an obviously smoky nose along with red fruits and spice in the background. Medium-light weight on the palate, the charcoal-like smoke returned in a big way on the finish. McHenry 1999 Pinot Noir, Massaro Vineyard, Carneros. Medium-light color, showing funky, earthy aromas along with a darker fruit profile than the recent Santa Cruz Mountains bottlings. Still retaining good acidity and finishing with moderate tannins, but the fruit is fading. McHenry 1999 Pinot Noir, Amaya Ridge Vineyard, Santa Cruz Mountains. Medium-light garnet color, this displayed earthy but bright black cherry fruit, tea leaf, and a touch of baking spice. Lively on the palate and finish, this has matured nicely. McHenry Vineyard produces only Pinot Noir. The estate vineyard was first planted in 1972, one of the oldest Pinot plantings in the area. It was originally about four acres in size and had included Chardonnay as well as Pinot at first, but it is now entirely Pinot Noir. The vineyard is sited on a gentle slope at just under 1,800-foot elevation and less than five miles from the ocean. The topsoil is shallow, with sandstone below. The first Pinot harvest was in 1976, and the first commercial release from the winery was in 1980. Unfortunately, like a number of other vineyards in this area, McHenry Vineyard was devastated by Pierce’s Disease in the early 1990s. It was replanted in 1997-98 with four Pinot clones – Pommard, Swan, 13, and 115. The winery continued to make wine with purchased fruit in the 1990s until the first vintage of Pinot from the replanted estate vineyard was produced in 2000. The vineyard is currently 2½ acres in size, but the McHenrys are planning to plant more Swan clone vines there, as these have produced particularly good wine at their site. We started our tasting with two Pinots from the 2010 vintage, their regular estate wine and then a special estate “Swan Clone” bottling composed mostly of fruit from the Swan clone vines (there’s also some of the 13 clone blended in). The McHenrys are very happy with their 2010 Pinots, noting that the growing conditions were exceptional at their vineyard that year. The fruit ripened well, with brix mostly in the mid-24 range, while retaining very good acidity, with 3.3pH and 0.9TA at harvest. Both of these wines were very good, with the “Swan Clone” bottling having greater depth and complexity. We continued with the 2009 estate Pinot – this showed the smoky effects of a summer fire close to the vineyard that year. While I can’t say that I enjoyed the smoky aroma and finish of this wine, Ian and Brandon said that it has actually been fairly popular among a number of their customers who report that it goes well with barbecued food! We finished with two wines from 1999 that were made with purchased fruit. One was from Massaro Vineyard in Carneros – McHenry made a Pinot Noir from this vineyard from 1993 through 2000 – and the other was from Amaya Ridge Vineyard in the Santa Cruz Mountains north of Soquel. I thought the 1999 Massaro bottling was a bit past its prime, but the Amaya Ridge Pinot was holding up nicely. The tiny winery building holds the entire McHenry production. Ian and Brandon told us that in a good vintage such as 2012, they’ll produce around 500 cases, but significantly less in a tougher year like 2011. In addition to wines from recent vintages, the winery holds back a limited amount of older wines, including the two 1999 wines we tasted, and also including selected older vintages of estate Pinots. Bryan picked up a bottle of 2010 McHenry Pinot for us to share during lunch, which we enjoyed on some patio chairs just outside the winery. McHenry is a modest operation in every sense of the word, and the family-run nature of the business was very apparent at their Passport open house. I had tried a couple of McHenry Pinot Noirs at past Santa Cruz Mountains Pinot tastings and liked them, but I thought both of their 2010 Pinots were a step up from those earlier vintages. McHenry is such a small label that it’s easy to overlook them amongst the larger and better-known Santa Cruz Mountains Pinot Noir producers, but their 2010 Pinots show that they’re capable of making some standout wines. After finishing our lunch, we retraced our route back to the Surf City Vintners area in Santa Cruz. Sparkling wine specialist Equinox Wines shares space in a building there with Trout Gulch Vineyard, and as a bonus, Copious Winery had a table set up just outside the winery to pour their wines. We walked into the building, where Barry Jackson of Equinox was pouring his wines. Barry has been making sparkling wine in the Santa Cruz Mountains since 1989, helping to revive a tradition that was highlighted by sparklers produced by famed vintners Paul Masson and Martin Ray. Barry was pouring his Equinox sparkling wine as well as still wines from his Bartolo label, where he makes Grenache, Syrah, and several blends. Equinox 2001 Brut Reserve, Santa Cruz Mountains. Medium-light yellow-gold color, with shy aromas of very tart apple fruit along with yeasty and herbal notes. The acidity was somewhat sharp and the finish a bit short, perhaps this needs more time in bottle. Trout Gulch 2010 Chardonnay, “la pêcherie,” Monterey. Made entirely in stainless steel. Light color, displaying stone fruit and tropical fruit plus a touch of spice on the nose. Lighter-bodied, moderate acidity and a slightly oily texture, with a fairly smooth finish. Trout Gulch 2010 Grenache Rosé, “la belle petite poulette,” San Antonio Valley. Sourced from Pierce Ranch Vineyard. Medium-light garnet color, on the darker side for a Rosé, with ripe, almost candied strawberry aromas. Medium-light bodied and smooth, this showed some spice on the finish. Trout Gulch 2009 Pinot Noir, “la confluence,” Monterey. Sourced from six vineyards, and including Pommard, 115, 667, 777, 23, and 2A clones. Medium-light ruby color, ripe red fruits, dried herbs, spice, and vanilla/oak aromas. Medium-light bodied, this had good acidity in the mouth and a somewhat tart finish. Copious 2010 Chardonnay, Carneros. Aged for nine months in neutral oak. Fairly light color, this featured apple and pear fruit plus earthy notes and lots of spice on the nose. Medium-light weight with lively acidity on the palate and finish. Copious 2009 Pinot Noir, Central Coast. Medium-light ruby color, showing ripe and spicy red fruits along with herbs and a slightly floral note. Medium-bodied, with milder tannins, nice. Copious 2010 Syrah, Paso Robles. Dark color, with ripe plum and darker fruit, spice, and black pepper aromas. Medium-full bodied with a moderately rich mouthfeel, this finished with fairly big tannins. Copious 2010 Cabernet Sauvignon, Rutherford. Medium-dark purple, fairly ripe plum and blueberry fruit plus a big herbal component, spice, and undertones of vanilla/oak. Bold but lively in the mouth, with moderately grippy tannins, this could be nice given some time in the cellar. Copious 2010 Petite Sirah, Paso Robles. Slightly darker color, with dark berry fruit, baking spice, and pepper on the nose. Medium-full bodied, with big, chewy tannins. Copious NV “White Elephant,” Carneros. About 4% residual sugar. Medium-light straw color, with ripe, sweet peach and apricot aromas along with some spice and a slight matchstick note. Smooth and rich on the palate with a long and moderately sweet finish. Copious 2010 “Ace of Spades,” California. About 3% residual sugar. Medium-dark purple, showing ripe plum and blueberry, plus touches of pepper and spice. Rich and bold but not overly sweet, this finished with medium-big tannins. Equinox uses only the time-consuming méthode champenoise of producing their sparkling wines, which are sourced entirely from Santa Cruz Mountains Chardonnay and Pinot Noir fruit. The wines are known for long aging prior to release. Equinox is particularly known for their non-vintage Brut “Harmony Cuvée” and for the vintage Blanc de Blancs Cuvée de Chardonnay. We tasted just one of the Equinox and Bartolo wines that Barry was pouring at the Passport event, the Equinox 2001 Brut Reserve. This wine is a blend of 75% Chardonnay and 25% Pinot Noir, all sourced from Trout Gulch Vineyard. There was no dosage (sugar added after the second fermentation), and the wine had been bottled for only about a year, a testament to the length of time this wine was bottle-aged en tirage prior to riddling and disgorging. I was hoping to enjoy the Equinox sparkling wine more than I did, and as the rest of our group seemed to feel the same way, we opted to save some time and move on to one of the other wineries pouring at the same facility that day. Of course it’s neither possible nor fair to judge any winery by a single wine, and I would like to revisit Equinox in the future and give more of their wines a try. 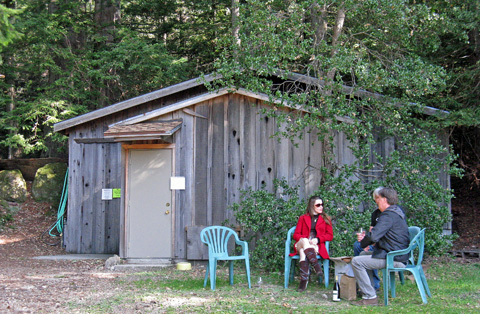 We walked toward the back of the building where Gerald (Gerry) Turgeon was pouring his Trout Gulch wines. Gerry’s father Bernard established his first winery in 1974, when he and Jerry Lohr started their Turgeon & Lohr Winery (now J. Lohr) after planting 300 acres of winegrapes in the Arroyo Seco area of southern Monterey County. Bernard sold his share of the business to Jerry Lohr in 1984, and the following year he and Gerry launched the Santa Cruz Brewing Company and the Front Street Pub, one of California’s first post-Prohibition brewpubs. Gerry had already earned a degree in viticulture and enology from UC Davis by this time, and in 1986, Bernard returned to the wine business with Trout Gulch. The Turgeons purchased property above the town of Aptos, just four miles from the edge of Monterey Bay, and they planted about 25 acres of Chardonnay and Pinot Noir there. The first vintage of Trout Gulch wine was in 1988. Bernard retired from the business in 1999 and he passed away in 2012. While the vineyard itself was sold in the early 2000s, Gerry has remained in charge of the Trout Gulch label. The wines have been made at the Equinox facility since 2006. Still widely-known for their Chardonnay and Pinot, they have added a number of other wines to the line-up over the years. In addition to the three wines we tasted, other current Trout Gulch releases include Sauvignon Blanc, Tempranillo Rosé, and Merlot. Their Santa Cruz Mountains Pinot Noir is called “La Source,” and the most recent 2007 vintage was sold out. This Pinot was sourced from Regan Vineyard in the Corralitos area and from Amaya Ridge Vineyard above Soquel. 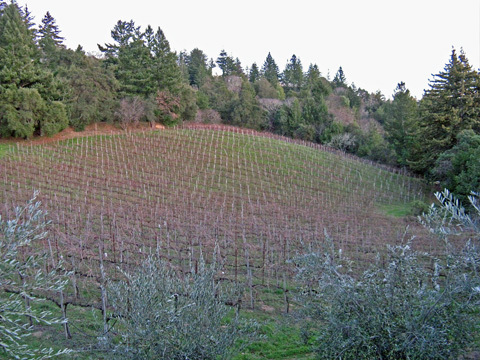 Trout Gulch may be as well-known as a vineyard source for other producers’ wines (Arnot-Roberts and Beauregard, for example) as for the wines from the Trout Gulch label itself. The wines we tasted were not bad but not really noteworthy either, with the Pinot from Monterey being my favorite of the three. I’d hoped to taste the “La Source” Pinot Noir, and I’d like to return and try this wine on a future visit. We stepped back outside into the bright afternoon sun, where we tasted some of the Copious wines. I was not familiar with this fairly new producer, but it turned out that Lance Campbell, proprietor and winemaker of Copious, had previously been one of the owners of Mt. Aukum Winery in the Fair Play area of El Dorado County, where I’d visited several times. Lance and his wife Brandie started the Copious label in 2009, and up until recently they were located in a space nearby the Equinox facility, though they are now in the process of moving to a new spot. Lance poured a selection of the winery’s current releases for us. The Copious wines are sourced from a variety of regions, ranging from Napa to Paso Robles. We started with a Chardonnay, with fruit from Larson Ranch in Carneros, near the old Carneros Creek facility. The Central Coast Pinot was sourced from Arrow Ranch in Cienega Valley south of Hollister, though Lance told us that 2009 was the only vintage that Copious got Pinot from that vineyard. The Syrah came from the Westside of Paso Robles, while the Petite Sirah was from the Eastside, and a vineyard in Rutherford was the source of the Cabernet Sauvignon fruit. We finished with two dessert wines, the “White Elephant,” with fruit from the same vineyard as the Chardonnay, and the “Ace of Spades,” a 50/50 blend of Petite Sirah and Cabernet Sauvignon. 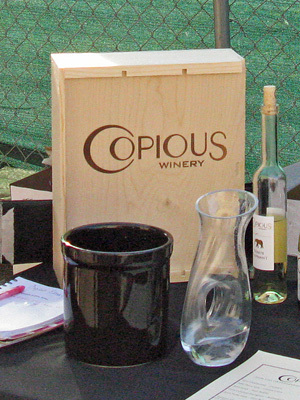 Copious also makes additional Pinot Noir bottlings, Sauvignon Blanc, Merlot, and a Bordeaux-style blend. Most of the current releases were bottled in September, and total annual production is about 1,400 cases. Copious was an unexpected find for me. Although I didn’t think the wines were truly exceptional, they were solid across the board – my favorite was the Central Coast Pinot, and the Carneros Chardonnay and Rutherford Cabernet were not far behind. It would be nice to see Copious use some Santa Cruz Mountains vineyard sources – and perhaps we’ll see that in upcoming vintages – but regardless, Copious is a nice addition to the local wine scene. 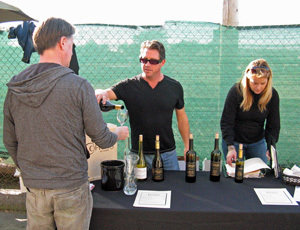 Wes suggested a stop at Byington Winery, in part to take advantage of tasting a couple of other producers – Downhill and Muccigrosso – pouring their wines there at the Passport event. We lost some time by taking the “scenic route” to the winery, though we did pass through some parts of the Santa Cruz Mountains where I’d never been. We drove by Ascona Vineyard – Wes is making a barrel of wine from their Sangiovese and Syrah fruit – high in the hills above Los Gatos along a lightly-traveled section of Skyline Boulevard. Eventually we reached Bear Creek Road, and after driving west for a few miles we arrived at Byington Winery. The parking area was crowded when we arrived. We walked into the first open doorway we spotted, which turned out to lead into the tank room, but we could hear plenty going on above us on a mezzanine overlooking the large wine tanks, so we headed upstairs to join in. All three wineries had tables set up there, and we made Downhill Cellars our first stop. Downhill 2010 Chardonnay, Santa Cruz Mountains. Very light color, with bright lemon aromas along with hints of fresh herbs and vanilla/oak. Moderately creamy texture with lively acidity and finish, nice. Downhill 2011 Pinot Noir, Central Coast. Medium-light ruby color, displaying plum and darker berry fruit, spice, and a good deal of oak. Medium-bodied with moderate acidity and milder tannins. Downhill 2008 Barbera, “Alessia,” Amador County. 100% Barbera. Medium-dark color, this featured intense ripe boysenberry and plum plus lots of spice and a dash of vanilla/oak on the nose. Bold and mouthfilling but with bright acidity, this had moderate tannins on the finish, nice. Downhill 2009 Petite Sirah, Alta Mesa. Dark color, with a funky note along with black fruits, spice, and chocolate. Full-bodied but not overly tannic. Muccigrosso 2008 Pinot Noir, Santa Cruz Mountains. Medium ruby color, showing tea leaf and savory aromas upfront followed by plum, berry, and earth. Medium-bodied with a fairly smooth texture and moderate tannins, nice. Muccigrosso 2005 “Table Two,” California. 50% each Syrah and Sangiovese. Medium-dark color, this had black cherry and darker fruit along with hints of dried herbs and oak. Medium weight on the palate with milder tannins. Muccigrosso 2006 “Lyn Zin,” Santa Clara County. Medium-light color, bright berry, spice, and black pepper on the nose. Medium-bodied with a lively mouthfeel and moderate tannins. Muccigrosso 2008 “Lyn Zin,” Santa Clara County. Medium color, with big, ripe berry fruit and lots of baking spice and vanilla/oak aromas. More full-bodied but with milder tannins than the 2006 bottling. Muccigrosso 2007 “Sirah/Syrah,” Central Coast. 60% Petite Sirah, 40% Syrah. Dark color, displaying some initial funky aromas that blew off, revealing black fruits, earth, pepper, and minerals. Big but lively on the palate, with substantial but refined tannins, nice. Byington 2008 Pinot Noir, “Block 4,” Estate, Santa Cruz Mountains. 50% new French oak. Medium-light garnet color, this had herbal cherry notes but also a strong and off-putting resiny, almost glue-like aroma that I assume was from the choice of oak. Medium-bodied with moderate tannins, but it was hard to get past the aromatics. Byington 2008 Pinot Noir, Estate, Santa Cruz Mountains. 30% new French oak. Medium-light color, featuring somewhat riper fruit than the “Block 4” but the same odd resiny character, though not as pronounced. Medium-bodied and a touch less tannic than the “Block 4” bottling. Byington 2007 “Alliage,” Paso Robles. About 80% Cabernet Sauvignon plus Cabernet Franc and Merlot, sourced from five vineyards. Medium-dark purple, with ripe currant and plum fruit, spice, and lots of vanilla/oak notes. Medium-full bodied with moderately big tannins. Byington 2006 Cabernet Sauvignon, Reichel Vineyard, Alexander Valley. Barrel-aged for 22 months. Medium-dark color, this displayed currant fruit and dried herb/tobacco on the nose along with lighter touches of spice and oak. More structured mouthfeel with a grippier tannic finish, this could use more time in the cellar but showed potential for good further development. Byington 2006 Cabernet Sauvignon, Bates Ranch, Santa Cruz Mountains. Aged for 22 months in 30% new French and American oak, plus 70% neutral oak. Dark color, plum and currant fruit with earthy and herbal notes. This had a rounder mouthfeel than the previous Cab, with good structure but more refined tannins on the finish. 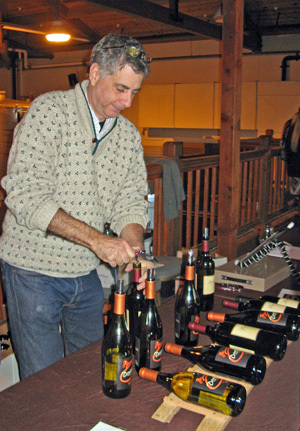 Downhill owner/winemaker Frank Ashton was pouring his wines at the Passport event. Frank is also the general manager of Byington Winery, and he produces the Downhill wines there. He’d previously run a specialty food retail company in the South Bay for over 20 years, and he’s been involved in the natural food and Slow Food movements over the years. Frank launched the Downhill label in the mid-2000s. In 2011 he also opened Flight Wine & Foods, a wine bar in Cupertino. Frank poured us four of the current Downhill releases – a Chardonnay, Pinot Noir, Barbera, and Petite Sirah. The Chardonnay came from a vineyard at about 1,800-foot elevation in the Santa Cruz Mountains, and was barrel-fermented in 40% new French oak. The Pinot was sourced from several Central Coast vineyards, and was bottled only about a month before we tasted it. The “Alessia” Barbera was from Cooper Vineyard in Amador County, a well-regarded vineyard in a region that is widely-considered one of California’s best for Barbera, while the Petite Sirah fruit came from Silvaspoons Vineyard in the Alta Mesa growing area of Lodi. Downhill also produces Viognier, Torrontés, Barbera Rosato, Cabernet, Zinfandel, a Zin / Syrah blend, and additional Chardonnay and Pinot bottlings. In the past, they’ve made a Pinot Noir from the historic Peter Martin Ray Vineyard. I had tried two or three Downhill wines in the past, and this tasting reinforced my view that this is a solid producer. I thought the Santa Cruz Mountains Chardonnay and the Amador “Alessia” Barbera in particular were quite good. This small sampling of Downhill wines makes me want to try more of them the next time I’m in the Santa Cruz area. The day’s Passport event was starting to wind down by the time we stepped over to the Muccigrosso Vineyards table. This is a small family winery run by Michael and Lynne Muccigrosso. Michael first planted vines in 1983 on the family’s Bear Creek Road property, not far from Byington. The family grows Pinot Noir and Zinfandel at their vineyard, a hillside site at around 1,500-foot elevation. The Muccigrosso wine label was founded in 2000, and the first wines were released from the 2001 vintage. The annual production remains small, under 1,000 cases. 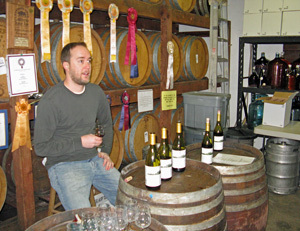 Sadly, longtime Muccigrosso winemaker Jacob Kauffman passed away suddenly in 2009 at the age of 34. We tasted five of the currently-available Muccigrosso wines. The first was a tasty 2008 Santa Cruz Mountains Pinot Noir, partly sourced from the estate vineyard. We followed that with a 50/50 Syrah/Sangiovese blend called “Table Two,” and then two vintages of “Lyn Zin,” named for Lynne Muccigrosso. The Syrah fruit for the “Table Two” came from the Hecker Pass area while the Sangiovese was from San Miguel, just north of Paso Robles. The two “Lyn Zin” vintages we tasted, from 2006 and 2008, were dramatically different from one another – I preferred the brighter 2006 wine. We finished with a big wine, a Central Coast blend of Petite Sirah and Syrah that showed quite well. The Muccigrosso wines were somewhat hit-or-miss for me, but the best of them, such as the Santa Cruz Mountains Pinot Noir and the Central Coast Sirah/Syrah, were certainly enjoyable. I noticed that all of the wines we tasted were from vintages prior to the loss of their young winemaker, and I’m not quite sure what the future plans are for this producer. We headed to the Byington Winery table to finish our Passport tasting. Winery founder Bill Byington had established Byington Steel Treating in 1950, and he and his wife Mary had originally purchased a 95-acre property in the Santa Cruz Mountains in 1958 with plans to make it into a family retreat. After deciding to plant nine acres of their property with Pinot Noir in the mid-1980s – being located just down the road from well-known Pinot producer David Bruce – Byington Winery was launched in 1987. Santa Cruz native Andrew Brenkwitz is the winemaker. Current releases include Pinot Noir from the estate vineyard, Chardonnay, Cabernet Sauvignon, Cabernet Franc, a Bordeaux-style blend, Zinfandel, Syrah, and a Port-style dessert wine. Other recent releases have also included Sauvignon Blanc, Viognier, Pinot Rosé, non-estate Pinot Noir, and Merlot. The winery also hosts weddings and various corporate and private events, including dinners held in its wine cave – completed in 2002, it was one of the first wine caves in the area. We tasted three Byington wines at their table, then made a quick stop at their tasting room downstairs to try a couple of other wines as they were starting to get ready to close up for the day. I much preferred the two Cabernets and the Bordeaux-style blend I tasted from Byington to the two 2008 Estate Pinots I tried. I thought the Pinots were marred by (presumably) the choice of barrels used in their aging – I’m hoping that they have changed to different barrels since that vintage. The “Block 4” Pinot is from the only portion of the estate fruit that is made into a separate bottling, and it was aged in a higher percentage of new oak. I didn’t find the odd match of wine and oak in the Cabernets or in the “Alliage” blend. The Reichel Vineyard Cab – from a 2,000-foot elevation vineyard in the volcanic soil above Geyserville in Alexander Valley – was my favorite of the Byington wines we tasted. Since I don’t have a great deal of experience with Byington wines, I’m hoping that those 2008 Pinots were an aberration. The other wines we tasted were good though unexceptional, and the handsome winery building and friendly and helpful tasting room staff left good impressions. I sense that the potential for better wines is present, and hopefully future tastings will feature more consistency. Bryan, Wes, Diane, and I enjoyed our Santa Cruz Mountains Passport Day excursion. It’s a beautiful area with a more laid-back atmosphere than most California wine regions. Although I thought the wines we tried were uneven, we did taste some fine ones along the way – the highlights for me were the two 2010 McHenry Pinot Noirs. In addition, the wines from Copious and Downhill were good, and there was enough promise from the other producers whose wines we tasted to warrant coming back to give them another try in the future. As always, thanks to everyone that we visited for being so generous with their time and their wine!